Ein stilles, stolzes Wolkenschiff. . .
Hermann Hesse was born on the 2nd of July, 1877, in the Black Forest town of Calw, Baden-Württemberg, into a pious Christian family. His father was an Estonian-born Pietist preacher, and his mother, who was born in India, worked as a missionary. Both his parents were employed in the missionary publishing house Basler Mission, that was overseen by Hesse's grandfather. Hesse was first schooled at the Mission's boarding school in Basel, before moving back to his family in Calw, where he attended the Latin School in Göppingen. In 1891 Hesse received a scholarship to the Evangelical Theological Seminary in Maulbronn, and it was here that the rebellious side of his character, that would bring him time and again into conflict with his parents, began to reveal itself. A round of spells at different schools and institutions followed, and after several periods of depression, Hesse attempted to commit suicide in 1892, and was admitted to a mental institution in Stetten im Remstal, Stuttgart, by his parents. Letters to his family from this time express the acute sense of abandonment felt by the teenage Hesse, who saw himself as forsaken by God, his parents, and the world. In 1893, despite passing the first year exam at Cannstatt grammar school, Hesse left formal education, and from 1895 to 1901 was employed as an apprentice mechanic at a clock tower factory. He later worked as a bookseller in Tübingen, and his first collection of poetry, Romantische Lieder, was published in 1899. In 1904, having already made a name for himself as a writer, Hesse married his first wife, the photographer Maria Bernoulli, with whom he went on to have three sons. He began working collaboratively with other writers to produce the left-liberal newspaper 'März', where he was editor of the literature section, and together with the painter Hans Sturzenegger, travelled for several months through Ceylon, Singapore and Sumatra. The Orient, already a destination for the missionary work of his parents and grandfather, now became a source of spiritual and religious inspiration for Hesse himself, and an influence on his literary work. When the First World War broke out in 1914, he enlisted as a volunteer, and although unfit for combat duty, began work as a welfare officer for prisoners of war in Bern, Switzerland. A series of serious incidents affecting his family - including the death of his father in 1916, and the onset of his wife's schizophrenia - coupled with his disappointment about the lack of political engagement from artists and intellectuals during the war, plunged Hesse into a period of profound crisis. He was forced to leave military service, and underwent a course of psychoanalysis, carried out by a student of Carl Gustav Jung. After divorcing his first wife, Hesse married Ruth Wenger - the daughter of the Swiss writer Lisa Wenger and aunt to the Surrealist painter and photographer Meret Oppenheim - in 1924. However, this marriage was also to end in divorce only three years later. In 1931, now married to his third wife, the Ukrainian-born Ninon Dolbin, Hesse moved into a house in Montagnola, today named 'Casa Hesse'. Despite the lack of pronounced political statements in Hesse's work in the 1930s, his private correspondence and literary criticism from this time express an unambiguous rejection of the National Socialist Regime. Having obtained Swiss citizenship in 1923, Hesse now acted as the first point of call for numerous artists who left Germany and fled to Switzerland during the Third Reich. 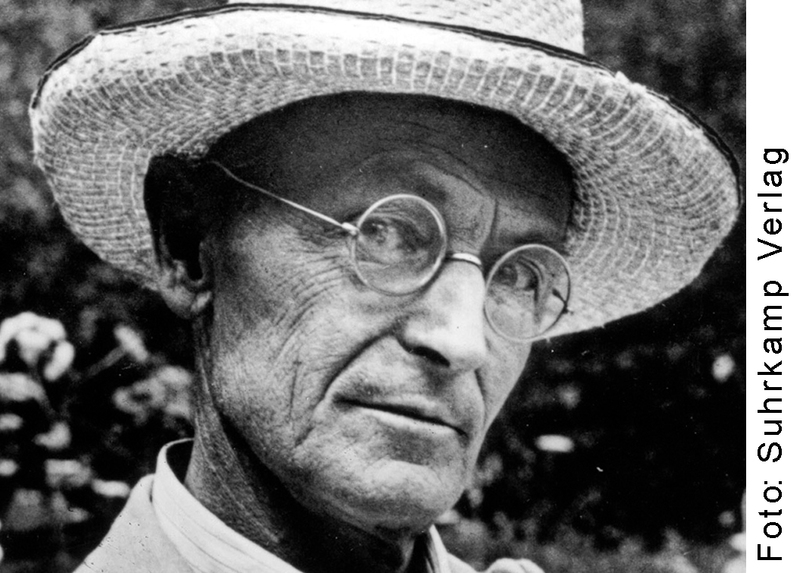 With ever worsening health and slowly losing his eyesight, Hesse withdrew almost completely from literary life after 1945. Hermann Hesse died in Montagnola on Lake Lugano, where he had spent the longest period of his life, on the 9th of August 1962.